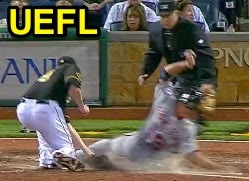 Instant Replay Review confirmed HP Umpire Todd Tichenor's safe call in the top of the 8th inning of the Nationals-Pirates game. With two out and two on, Nationals pitcher Bryan Morris threw a 0-0 fastball for a passed ball, catcher Russell Martin to Morris as Nationals baserunner R3 Kevin Frandsen slid into home plate. Upon Replay Review as the result of a challenge by Pirates Manager Clint Hurdle, Tichenor's ruling was affirmed, the call was correct. At the time of the review, the Pirates were leading, 4-3. The Pirates ultimately won the contest, 4-3. This is Todd Tichenor (13)'s third Replay Review of the 2014 MLB Regular Season. This is Crew Chief Tim Welke's 22nd supervised Replay Review of the 2014 season. This is the 348th Instant Replay Review of the 2014 MLB Regular Season. This is Pirates Manager Clint Hurdle's 17th Replay Review of 2014. Umpires are now 181/348 (.520 Affirmation Rate) in Replay Reviews during the 2014 MLB season.